After watching this new Blogetheque Take Away show, I wonder if Chicago and our new Mayor Raum Emanuel would ever open up City Hall and let a local band rock out like Battles did in Paris. As we’ve explored before, Blogetheque continues to push the boundaries and redefine what a concert venue and a live music experience really is. 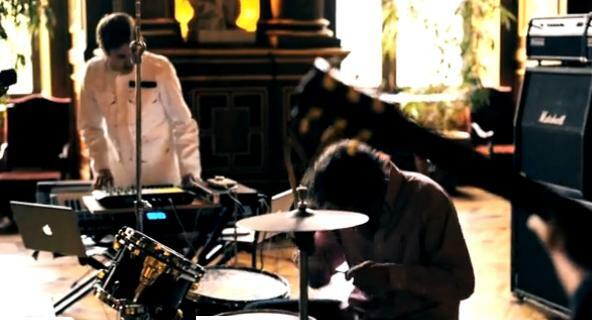 Watch and wonder along with us as Blogetheque captures math-rockers Battles righteously rumbling the heck out of the Hotel de Ville in Paris with “Wall Street,” a new track from their latest album Gloss Drop that’s due June 6th. This unique set brings me back to the first time I saw Battles at Pitchfork Festival 2008. Battles blew me away then, and after watching this Blogotheque video and looking back at the history behind The Hotel De Ville, I am amazed at how vital a role the Paris City Hall has played in French history. It’s been the site for many protests and controversial music festivals like the Sleepless Festival. And I can’t help but wonder what sort of impact this Battles set will have on the surroundings and the people who were there during the performance and who have been there since. This is great stuff to think about because live musical performances like these tend to stick to our hearts and brains long after the music is over, especially when you consider the funny links between music and our bodies. And besides our bodies it’s equally amazing to think about the impact of the performance on the building itself, especially when you consider the power of acoustic resonance. All this said, I would love to interview the not only the fans who witnesses this show, but I would also love to interview the walls, floors and other structures in the Hotel De Ville to see what they have to say about the Battles performance. Without a doubt, this video get me psyched to hear the rest of Gloss Drop and see Battles when they come to Pitchfork 2011 in Chicago in July. For days we were searching for hangars, warehouses and big empty loft spaces. We got the opposite along with the immoderate enthusiasm of Agnes, who works with the city’s cinematography association and wanted to see “what it would be like, a Blogothèque concert at the city hall”. It was incongruous, it was bloody exciting. We were going to shoot Battles in a rococo style lounge in The Hotel de Ville, the magnificent city hall and mayor’s office in the centre of Paris. Enjoy the video and check out the rest of their tour dates at the Battles headquarters!